What on earth is earthvpn? Read on to find out more. EarthVPN is one of the few VPN service providers out there in the market that has managed to make quite an impact in the industry this year (along with last year as well). The main reason why EarthVPN has managed to take giant strides towards the top of the VPN ladder is because of the low prices of its VPN packages. That doesn’t mean it doesn’t offer a high-quality VPN service. 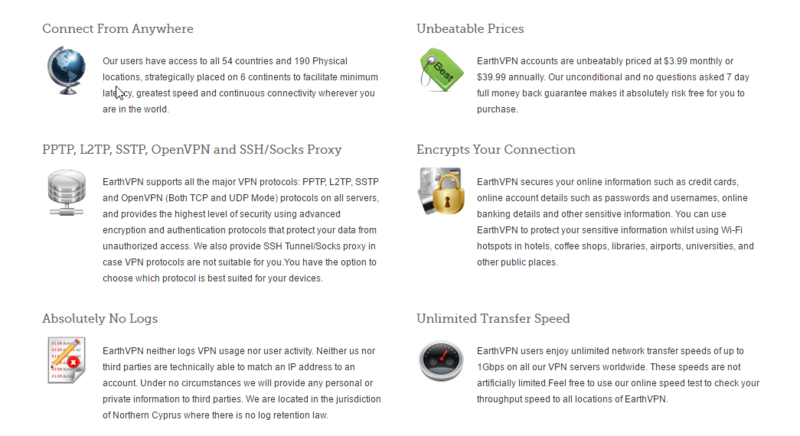 In fact, EarthVPN offers a rich set of features along with its VPN service. That is one combination that is very hard to find in the VPN industry today. But just because a VPN service provider offers a good mixture of features and affordability, does that automatically mean it is amongst the best VPN service providers in the market? EarthVPN is a VPN service provider that is located in Northern Cyprus which is actually considered to be the Turkish region of Cyprus. And because it is not situated in a country like the United States of America or the United Kingdom, it can get away with a lot of stuff that VPN services based in the US and the UK can’t get away with. Perhaps that is also the reason why EarthVPN has a no log policy. That is, the VPN company does not keep any data on its users as per official policy. Most VPNs based in US and the UK can’t do that. But having an official policy is one thing and fulfilling the promises made in that policy is another. As we will detail below, some reviewers of EarthVPN have come across issues with EarthVPN following its no log policy turning out to be not so genuine. Most of you would not have heard about EarthVPN before this review. Or maybe you just heard about it and then Googled it. And then came across this review. That should tell you straight away that EarthVPN isn’t a big VPN player in the industry just yet. No one really knows what EarthVPN is all about as a VPN service provider. As we have indicated above as well, you can confidently take EarthVPN as a bright up and coming talent in terms of its services and the prices of its packages. Will it fulfill its potential? Only time will tell. This review can certainly help though. EarthVPN offers new users a simple way of subscribing to its VPN service. That is, it keeps the price structure relatively simple. And new users always like the product to be simple in its presentation. That’s not really news. What may come as news to most of you is the fact that simplicity is a theme that EarthVPN tries to carry for everything else it offers and represents. That’ll become more clear to you once you reach the end of the review. A lot of top VPN service providers try to wow new users with lots of extra features and a confusing number of packages. EarthVPN does none of that. It has only two packages. These two packages are simply named Monthly and Annually. The Monthly EarthVPN package allows new users to subscribe to the service for a period of one month (which was kind of obvious before as well) for a price of $3.99. 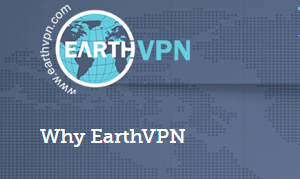 The Annually package of EarthVPN offers the same service, with all the features for a final price of $39.99 which comes down to less than $4 a month. So if you want to subscribe to EarthVPN on the cheap then better do it by signing up for the annual package rather than the monthly one. Most VPN service providers reward news users with heavy discounts if they show faith in the VPN company. EarthVPN is no exception as mentioned above. Now you really know everything there is to know about EarthVPN packages. Two packages, with two prices. The rest is the same and hence users will find it relatively easy to make up their mind. You can either sign up for one month or sign up for twelve months which will save you around $8 for the year. To put it another way. If you sign up for EarthVPN for a full year then you get two months free as compared to the monthly package. These prices are really low. 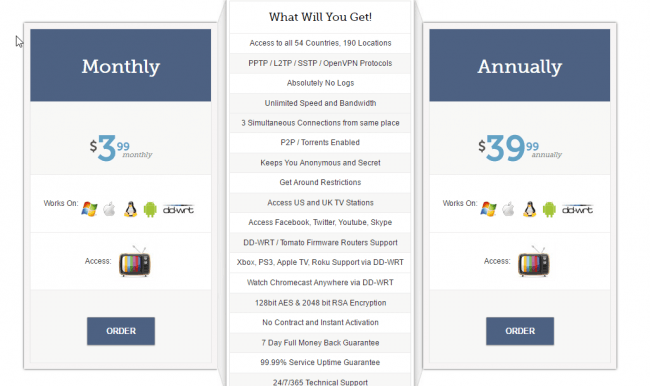 In fact, these prices are some of the lowest we have seen in the VPN industry. And hence, as far as prices go, EarthVPN is one of the best VPN service providers in the whole world. As far as payment options go, EarthVPN leaves no stone unturned. In other words, EarthVPN offers the widest possible range of payment options seen in the VPN industry. In this aspect too EarthVPN has its competition beat. Now that’s one heck of a list of payment options. With these options available, you can rest assured that when you sign up for EarthVPN, your identity remains anonymous. Now, we’ve already told you that EarthVPN is one of the cheapest, if not the cheapest, VPN service provider in the market. However, if that doesn’t sell it for you outright then you’ll be glad to know that it also offers a seven-day money back guarantee to any new user who aren’t sure about its VPN service. What that really means is that users can basically take the VPN service for a test run before they commit a large sum of money to the VPN company. You can use EarthVPN and all it has to offer, for free, for a period of up to seven days. If you’re not satisfied with the service, you can simply cancel the subscription and get your money back. But given the fact that the standard package costs just $4 a month, a lot of people would simply test out the service for a full month rather than for a week. If you do want to sign up for EarthVPN then, as mentioned before, your best bet is the annual package. Because then you’ll only pay $3.33 per month as opposed to $4. Simple packages and low prices. These two qualities describe EarthVPN. At the moment that is. Does EarthVPN deliver quality service for such a low amount of money? EarthVPN has all the standard features of a typical VPN service. But if you want to beef up your EarthVPN experience then you can do that with help of some extra features which can be included in your EarthVPN package for some extra payment. You’ll have to pay around $1.9 every month in order to avail these extra features. But since the standard EarthVPN package is so cheap, you might as well go ahead and sign up for the bonus features as well. Of course, not every user would want to pay such an amount of a VPN service provider that is new and untested in the harsh environments of this business, but it never hurts to experiment sometimes. One thing that EarthVPN staff could have done better though is the explanation. It’s very difficult to know about these extra features, and the resulting extra payment, on the official website on your first visit. So what are those additional features? Well, first you can add one more device that can be connected to EarthVPN VPN service simultaneously. You can connect those devices to the same given server even if they are physically located in different location. The standard EarthVPN package only allows simultaneous connection of up to three devices and they must all be present in the same physical location. The bonus feature adds a device and removes the location constraint. The second bonus feature allows the user to sign up for a static IP address. You can also upgrade your OpenVPN connection to use a 256-bit AES encryption instead of the standard one. If you want EarthVPN to enable SSH Tunnel or Socks Proxy for you then you can do that by paying them the extra $1.99 per month (that’ll also allow you to have access to all the other bonus features as well). Most of you won’t want to pay the extra charge for the additional features. But considering that EarthVPN has to keep the prices for the EarthVPN packages really low when compared to other VPN service providers, it starts to make a little sense. Moreover, not every user would want to have these features included in the standard package so why should that user pay for these features? In the end, it makes perfect sense to offer features to new users based on their needs rather than the business needs of the VPN service provider. You should also remember that VPN service providers who do provide these same bonus features as a part of their standard package, also charge their users more for the standard packages. So in the end, most of the things check out. However, that should not keep us away from the fact that some of the “additional” features have become the default features for most other VPN service providers. In fact, there are some standard features in the VPN industry that aren’t even included in the “bonus” features for EarthVPN. Features such as DNS leak protection along with more server information (in terms of statistics) should have been included in the standard package. But as we have it, they aren’t even included in the bonus package. At the time of writing, EarthVPN offered the four most common VPN protocols in the industry. According to the official sources, EarthVPN provides a native client for almost all operating systems and devices. And while that is certainly true, there are a number of problems with that claim. The major problem is that the installation process isn’t exactly straightforward even though the support is there. For example, if you visit the official EarthVPN website and then go to the setup section, you’ll see that EarthVPN really does provide support for the various operating system along with devices. There are comprehensive tutorials on how to set up the VPN service on all available platforms. They even teach you how to select your favorite protocol with the VPN service. All of this is great. Except for the fact that if you’re a new user, you’ll get confused. Hell, we think even some experienced users may need to spend a bit of time to get a hang of things here. The second problem is that, while you can launch EarthVPN on any of the mentioned operating systems, you’ll have to set up the VPN connection using manual methods. In this day and age, that is a complete waste of time. For example, say you have an iPhone and you have decided to use EarthVPN on it to get protection. To do that, you’ll first have to download and install the VPN service on your device. That is fine. But then, to actually use the service you’ll have to enter the details of your favorite/chosen server by going to the menu and then to the Settings and then input the details in the VPN section. You’ll have to do all of this manually. Of course, the tutorials on the official website are there to help you out in this regard, but since the competition is so tough in the VPN industry, this doesn’t give a good first impression. As mentioned before, the tutorials do have a step-by-step format and there are images in those tutorials as well to further help new users out. As far as premium VPN service providers go, almost all of them have a one or two click setup process and are generally more user-friendly than EarthVPN. And while EarthVPN may offer the same functionality, it doesn’t have the same user-friendly interface or presentation. EarthVPN also does not have a native app for operating systems such as Android and iOS, which is a huge minus considering the number of people who may want to use a VPN service on these devices. If EarthVPN wants to, one day, become one of the top VPN service providers in the market, then it will have to work hard in these two specific areas to achieve that dream. Otherwise, it will be a rough road ahead for them for a considerable amount of time. What about the Windows app then? Luckily for its survival, EarthVPN has managed to flesh out the Windows app appropriately. It has done a lot of neat things which more or less pay off for the VPN company. With that said, it is true that EarthVPN could work on the initial download a bit more. The process is anything but straightforward. By that, we mean that first, you have to download the application’s package which comes in a ZIP format. That means you’ll have to manually extract the ZIP file in order to begin the installation process. Then you’ll have to install the extracted package. Now all of these steps aren’t necessarily what you’ll study in rocket science, but these do take time when they shouldn’t. And what happens if a new user is not familiar with ZIP files or the extraction process? They will encounter problems and will likely leave EarthVPN for a VPN service provider that is more user-friendly and straightforward. The user interface of the Windows application is not the most impressive but does get the job done. One you have spent enough time with the Windows app, you’ll be able to get accustomed to its layout pretty easily because it has everything a new user could need in easy to reach places. In other words, there are very few layers of menus where you have to go in order to connect to the internet via a VPN server. If you look at the Windows app, you’ll see a prominent top section. That is where you have to input your username and password in the relevant fields. After that, you can see some tick boxes along with the drop-menu fields. You can use all of these options to tweak your experience with EarthVPN. If you want to save your username and password for all future logins then you can do that as well. The first drop-down menu choice among the four, allows users to choose between the various VPN protocols. The second drop-down menu choice lets new users select their favorite port. Of course, all these options are not for people who have no prior experience with a VPN service. And this is where we’ll mention again that EarthVPN did not do a good job. Offering such advanced settings right up front is intimidating and dangerous for new users. Anyway, we hope they can rectify this situation. As far as the end user is concerned, the best line of action is to leave the advanced options alone and continue with the default settings. EarthVPN will work more than just fine without you meddling with the inner working of the VPN service. Then there are the two boxes below those four drop-down menu options. The first allows new users to select their country of choice. This is basically EarthVPN’s way of saying that you can use this box to choose where you want your server to be physically located. The box below that one goes one step deeper. The first box allows you to choose countries. The second box allows you to select a location within the selected countries. Basically, the second box is a list of VPN servers which are available to users for connection. Some countries might have multiple VPN servers while some countries might not even have servers. Coming to the bottom of the main interface, and you can see three tick-boxes. One of these tick boxes allows new users to turn on auto-reconnect. That is pretty self-explanatory so we’ll leave it at that. The second of these boxes offer users to troubleshoot a connection while the third one is used to kill the entire internet access if, for some reason, the VPN server connection drops. The kill switch feature is a nice addition as it ensures your protection and privacy even when there is no internet connection. There is little doubt about the fact that speed matters when it comes to VPN service providers. If a VPN service offers all the features in the world, and at a low cost as well, but doesn’t offer speed, it is more or less useless. Let’s just remind ourselves that there is no one single speed statistics which can tell you if a VPN service is fast or not. It depends on your location. The location of your server along with how many other people have connected to the same server. It also depends on your VPN protocol. Generally, though, EarthVPN offers decent speed. However, if you’re looking to carry out some data intensive tasks with EarthVPN then this isn’t the VPN service for you. You’re better off with other options such as IPVanish or ExpressVPN. However, if you just want to stream YouTube or Netflix and want to visit media heavy websites, then EarthVPN should be able to provide you with more speed than you could need. Also take note that while you can get more speed by using the SSTP protocol, it is not as safe and secure as OpenVPN. OpenVPN protocol will decrease your connection’s speed, though. EarthVPN also offers unlimited bandwidth to all its users. That basically means that you can open up multiple tabs and use multiple applications that eat your bandwidth and not worry about the connection speed being affected. Not the most advanced feature, but every feature helps the VPN company to sell better. Keeping in mind the prices that EarthVPN charges for its packages, you might think to yourself that the number of choices of VPN servers could not possibly be great. In reality though, EarthVPN offers one of the most diverse range of VPN servers that we can remember. EarthVPN offers VPN servers to its subscribers in over 54 countries. Moreover, they have VPN servers in more than 190 different physical locations. Most of the VPN servers that EarthVPN operates on are positioned in regions such as North America and Europe. But since almost all other VPN service providers do the same, it looks like EarthVPN just decided to follow the trend and play it safe. As far as continent go, EarthVPN offers VPN servers in all six of them. In fact, some of the locations of EarthVPN’s servers are pretty unknown. For example, EarthVPN has about three servers in the vast region that is named China. Additionally, it also has VPN servers located in no-go countries such as Thailand, Iran, and Pakistan. So the number of VPN server choice is crazy. We admit that. What does that mean for the end-user? It means that there will hardly be a VPN user who will not be able to find an EarthVPN server in a location that works best for him/her. If you want to bypass censorship which has been forced upon you by the state or just want to access the best version of Google Play Store or Netflix or just want to protect yourself against hackers and other cyber criminals, EarthVPN has got your back. With this huge variety in the location of VPN servers, you’ll be able to access any website in the world at any given time regardless of your physical location on the map. One other point to note here is that all VPN servers offered by EarthVPN are available to all its subscribers. IN other words, it doesn’t matter if you have signed up for the monthly package or the annual package. You’ll experience everything the same as every other user using EarthVPN. Before we specifically discuss the customer support, let’s first discuss the official policies that make sure that customers are well treated and well rewarded for their subscription. Off the bat, EarthVPN is very concerned about all of its users’ privacy. Which it should since it is a VPN service provider. On the other hand Turkey, for all its history, has been an active region as far as political confrontations are concerned. With the recent media crackdown, existing laws are sure to get more strict. Some readers might not feel entirely comfortable signing up for the service that is based in Turkey. Now comes the good part though. Even though Northern Cyprus is considered a part of Turkey, it doesn’t come under Turkish laws and hence potential users don’t have to worry about the political situation in Turkey. This by the way also allows EarthVPN to justify its claim of having a zero log policy. You can read more about it on the official website which clearly mentions that neither the company nor any third party company has the technical expertise to match an IP address to an account. It’s just not possible, in other words. But what about that 2014 news from Netherlands where an EarthVPN user was arrested for threatening people with bomb attacks at a school? Well, first, law enforcement agencies did arrest that guy in Netherland and yes, they did track that guy with the use of his IP address which was supposed to be hidden from all surveillance behind a VPN connection. Does that mean your IP address is not safe with EarthVPN? See, what really happened was that, since the data center that was being used to operate EarthVPN services kept some IP transfer logs. Law enforcement agencies in Netherlands had this lead and made use of a court order in order to take over that EarthVPN VPN server. From that, they were able to gain information about that VPN-using person. Since then, EarthVPN has abandoned the use of that particular data center and have announced that they have employed more methods in order to ensure that no logs are being kept at their data centers. Still, though, it doesn’t look good on EarthVPN’s resume as a VPN service provider. Could an incident like that happen again? Don’t bet on anything. Ever. As far as customer support is concerned, EarthVPN offers quite a few methods for subscribers to get in touch with the VPN company. They don’t have any live 24/7 support (almost all of the premium VPN service providers offer this service since people do get attracted to an always-on customer support) but do have the industry standard ticketing email system. Don’t expect instantaneous responses though. The best way to solve your VPN-related problems is to go through EarthVPN’s FAQ section on the official website and move forward from there. If you follow their official tutorials you should not run into any major problems while installing and operating EarthVPN. EarthVPN has a bright future ahead of it. If it continues to improve. Security should be at the top of your priority list whenever you sign up for a VPN service. EarthVPN, we’re happy to report, has decent encryption levels. The L2TP\IPsec VPN protocol makes use of a 3DES or AES encryption. To further strengthen the overall encryption, EarthVPN also uses a 256-bit key. Moreover, with the SSTP VPN protocol, EarthVPN uses TCP Port 443 which is the standard for SSL transmissions along with 2048-bit SSL encryption. The 2048-bit SSL encryption will work wonders for you if you happen to reside in a place like China or Iran. As far the OpenVPN protocol is concerned, EarthVPN uses a 128-bit AES with an SHA1 hansh algorithm. Although that makes the OpenVPN protocol with the weakest encryption, a 2048 RSA key authentication makes sure that the encryption levels are up to the standard at any given time. As mentioned before as well, if you can cough up $1.99 in addition to the standard charges then you can upgrade your OpenVPN 128-bit AES encryption to 256-AES encryption. The basic price, of course, won’t remain the same but neither will the encryption. For everything you pay, you’ll get something worthwhile in return. Besides, even with the extra charges, EarthVPN is pretty cheap when compared to some of the other VPN service providers out there in the business. It’s always hard to reach a definite final conclusion about any VPN service and EarthVPN is definitely one of them. There are so many promising features but some obvious areas need more work if EarthVPN wants to make it to the top. First is the speed. EarthVPN needs to provide more speed to its users if it wants to be named alongside IPVanish and ExpressVPN. Along with that, EarthVPN has to make sure that its servers provide the same speed regardless of the protocol being used or the location of the server that the user has connected to. Moreover, they should also introduce live chat customer support 24/7. EarthVPN has a lot of good things going for it too. For example, it has a great variety in its number of server location. The number of servers being offered is also remarkable for a VPN service that is so affordable. The strongest point in favor of EarthVPN is the price. It isn’t just low. It is amongst the lowest. The VPN service quality is pretty reasonable as well especially considering the price EarthVPN is asking for it. If EarthVPN can pull its socks up and work hard to improve on its flaws then it has a chance to become even more popular. Then again, with the price they are currently offering, it will be hard for the developer team behind EarthVPN to improve the service without compromising on their strength i.e the price. EarthVPN, overall, is an excellent VPN service provider but users who don’t have budget issues should go for one of its competitors. Not really competitors, but more like the big players in the industry. If you are serious about getting the best value for your money VPN then you should check out IPVanish. They are our top ranked VPN provider. Read the IPVanish Review here. EarthVPN has done remarkably well to establish itself as an upcoming great VPN service. But it needs to work on some issues in order to further prove itself as the best VPN service for the money.